Northbrook, IL, December 4, 2018 – ScanBox by Digital Check®, the popular tablet-based scanning platform for banking kiosks and self-service stations, is now available in North and South America after a successful introductory period in select overseas markets. After a notable debut at the Paris Banking Show in late 2016 – where it received an Innovation Award for new products – ScanBox has featured in several pilot programs for banks and retailers in Europe, Africa, India, and other locations around the globe. 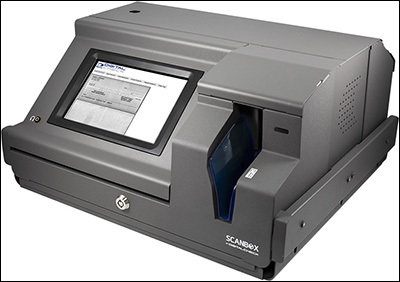 The ScanBox platform includes a modified CheXpress® CX30 check scanner driven by an application-provider-defined tablet mounted in a secure metal enclosure. It can be used to capture checks and check-sized documents either as a standalone device or incorporated into a larger multi-function kiosk. The ScanBox network module supports secure WiFi and Ethernet connections based on support by the integrator, as well as 3G/4G connections when supported by the tablet and the integrator. Several successful deployments in a variety of use cases have helped pave the way for the global launch of ScanBox. Besides its default role as a self-service option for bank branches, the device has also been used as bill pay collection points for private companies and government agencies, or alongside cash dispensers as a part of full-service, money service kiosks. While in-person bill pay kiosks are in the early product adoption phase in the United States, their simplicity and relatively low cost have made them popular around the globe. Pilot projects for ScanBox-based kiosks are already underway in South America – and could be coming to a location near you. Digital Check is the world’s largest manufacturer of check scanners and document capture products for teller capture, branch automation, remote deposit capture, and remote lockbox applications. Digital Check’s award-winning CheXpress®, TellerScan®, and SmartSource® check and document scanners are among the most cost-effective and reliable in the industry. The company also provides software solutions for image quality, vault processing, and remote monitoring of scanners across an enterprise.